Let's start with the first version of the man himself. A Nightmare on Elm St. (1984) wastes no time in giving us the basics. We see him creating his unique weapon, we learn he haunts the dreams of Tina (Amanda Wyss), and he likes to laugh a lot. This early iteration is short on the one-liners, although “I’m your boyfriend now,” seared itself into the public consciousness pretty quickly (the gross-out tongue phone didn’t hurt either). This initial Freddy isn’t really interested in turning into things either, he’s much happier to just pop out from some bushes or jump through a mirror. His one really notable transformation of sorts is having really long arms. It is a simple effect and even today there is something so odd about it, that is still a little unnerving to witness. So, what made this first encounter with the character so memorable? The bulk of that, of course, goes to Robert Englund’s loping, grimy performance. What makes Freddy really work for me is that there is this tension between this disgusting perverted murderer and the dream world he inhabits. 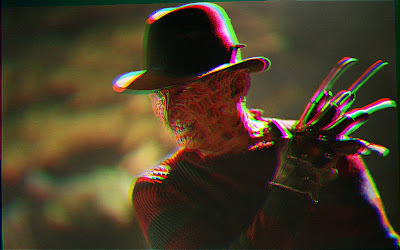 From the base character of Krueger, we also have quite of a bit of mystery too. How did he get like this? How does he operate in this world? There is just the barest hint of something larger and cosmic at work. It adds to the strange oppressive atmosphere that bleeds into the sunny world of Springwood. It is an element that Wes Craven will bring to the front in New Nightmare (1994), but you can see it ten years earlier already in play.